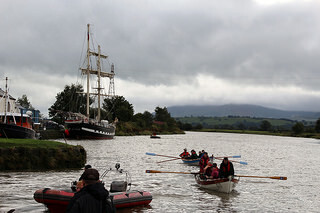 The third Nith Navigation Race saw Boatie Blest and four other Coastal Rowing clubs race up river from Glencaple into Dumfries on a fast tidal current. 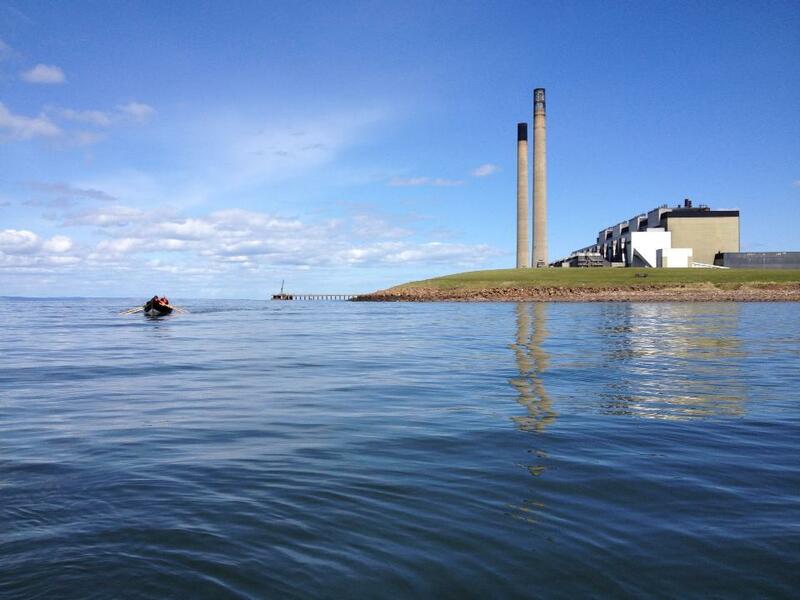 Crews were started at 30 second intervals with Boatie Blest, as most experienced club, setting-off several minutes after a crew of young lads from Annan, another all male crew from Amble across the border, then Carrick and Troon. A fast paced race tested both rowers and coxes who then rowed a further three miles back down river for Barbecue, results and prizes courtesy of host and organiser, Roy Kerr of the Port of Dumfries Development Group. 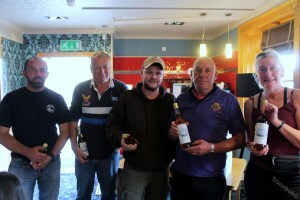 Results: Boatie Blest – with a time of 43 minutes – were presented with the winners’ Quaich and bottle of whisky. Also presented with a bottle were runners-up Troon 45 minutes 30seconds, Amble 46 min 15, Annan 50 min and Carrick 51 min 30. The previous weekend saw Boatie Blest crews take first and second places in Mull at a Regatta held off Tobermory. 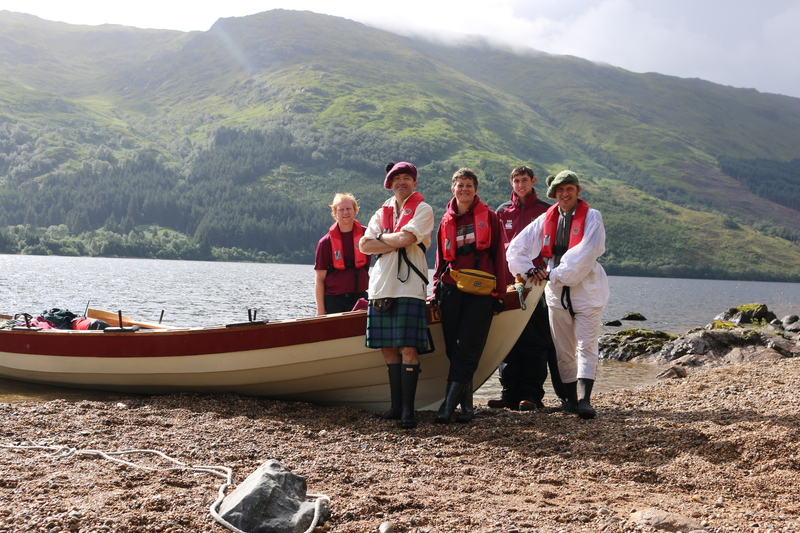 On Saturday 15 August, Cockenzie & Port Seton’s Scottish Coastal Rowing club, Boatie Blest, took part in an epic Highland journey commemorating a voyage made by Bonnie Prince Charlie. The crew, in their skiff Boatie Lodge, joined crews from North Queensferry, Anstruther, Ullapool, Portobello and Newhaven, with members of Boatie Blest and North Berwick also rowing in “Troika”, a new skiff built by young people from Muirhouse Youth Development Group in Edinburgh. The eight skiffs, accompanied by a Drascombe Lugger crewed by North Berwick rowers and a Mallaig-based RIB, rowed around 10 miles up Loch Shiel from Acharacle on the Friday, and then – well-armed with insect repellent and midge nets – set up a wild camp in the woods by a small beach at Glenalladale. On the Saturday, with many rowers clad in Jacobite costume, the boats continued up the loch for a further 7 miles, commemorating the trip made by Bonnie Prince Charlie, who was rowed up Loch Shiel to raise his standard at Glenfinnan in 1745. On arrival at Glenfinnan, 7 boats lined up and saluted with raised oars as the newly-launched skiff, Troika, rowed through to land on the beach, where Glenfinnan Highland Gathering was in full swing. 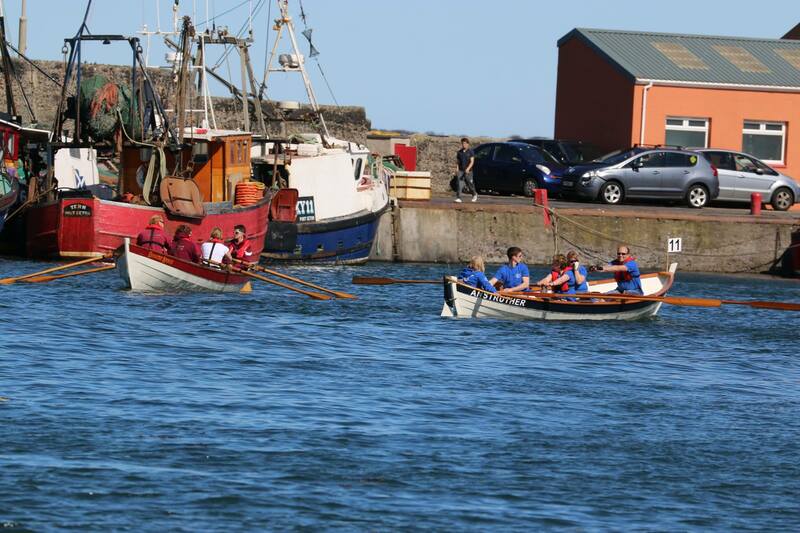 The Northumberland town of Amble held its first ever rowing regatta last weekend (Sat 30 May) with nine clubs taking part and East Lothian being represented by no fewer than three: Dunbar, Eskmuthe (Musselburgh) and North Berwick. Although perhaps not the glorious summer’s day they had hoped for when they first pencilled in the event in the rowing calendar, a fantastic day was had by all. Because of the adverse weather the original plan for a race around Coquet Island had to be scrapped in favour of a series of sprints in the more sheltered inner bay. 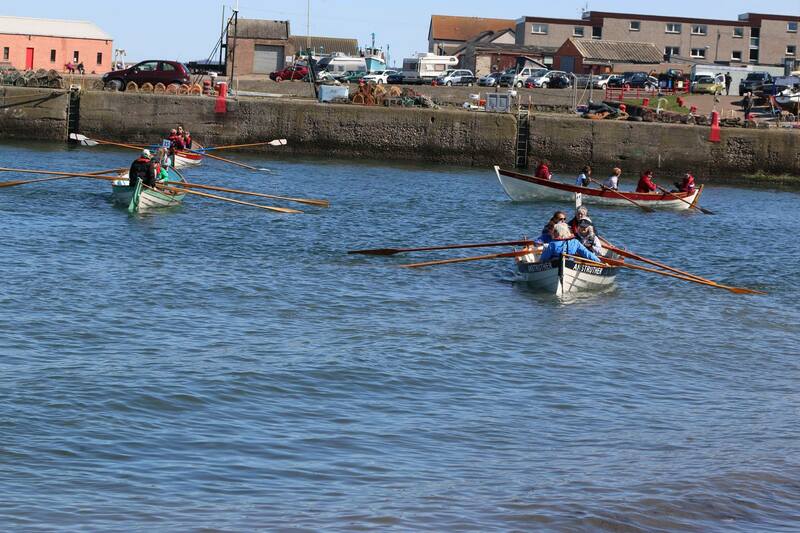 All three East Lothian clubs won their first heat, but it was North Berwick and Eskmuthe that eventually made it through to the final, with the latter coming out as winners. Not only was this Eskmuthe’s first ever win, it was the first time the club had raced in their new boat, “Steedie Falconer,” which they built over the winter and launched in May. Big smiles all round for the Musselburgh club! With the race over, it was time for another first for Eskmuthe, a river row, this one up the River Coquet to Warkworth, then a change of crew and back to Amble. By this time the sun was out and the scenery was absolutely stunning: lush green countryside, with herons and ducklings keeping the boats company in the Sunday sunshine. This was a perfect advert for people to get involved in the increasingly popular sport of coastal rowing. 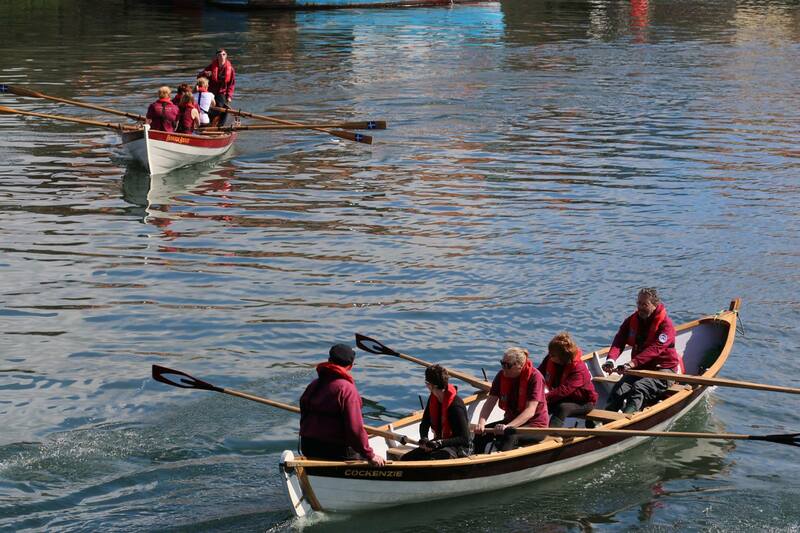 Amble Club, who excelled with flexible organisation and a welcoming smile, will visit East Lothian very soon: Sunday 14th June for Sunny Dunny’s Regatta, during Dunbar’s Civic Week. Want to see the power station chimneys before they are gone! Fancy trying a new sport or simply want to meet other people in your area then this Sunday you shou…ld be down at Port Seton Harbour. The club is running a come and try session on Sunday (13/9/15) taking people up towards the power station to look at the historic site before the chimneys are demolished. Boats will be leaving Port Seton from around 1300. No experience is necessary, all equipment you need is supplied and best of all its totally free!! Kids are welcome as well although those under the age of 16 will require their parents to be in the boat as well and sign a disclaimer form. Club is open to all ages and abilities. Please share this unique opportunity around our community! Better late than never the first race Cockenzie verses Port Seton .Cockenzie were the winners . Come on Boatie lodge you can do it. Can North Berwick beat the home team? Thanks to everyone for coming hope you enjoyed your day. When a coastal rowing and boatbuilding club holds a raffle, what else is the prize likely to be but . . . a boat. Boatie Blest raised money for Cockenzie & Port Seton’s Community Rowing Club by raffling a magnificent model of Captain Cook’s famous ship, Endeavor. 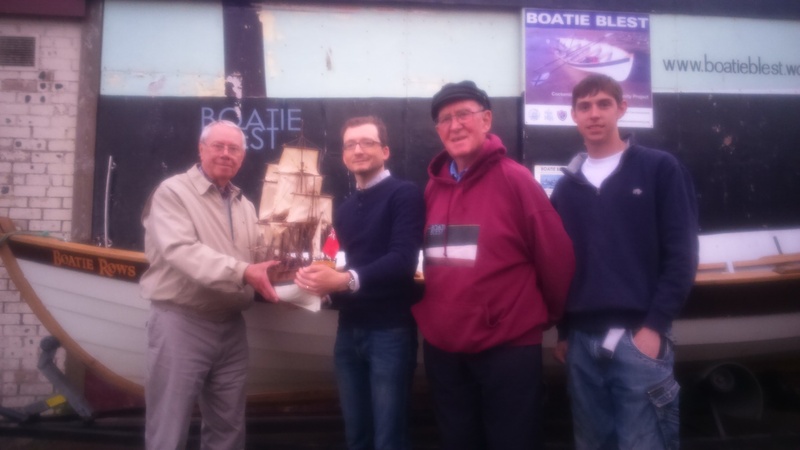 Winner, Martin Jones of Cockenzie was presented with the prize by Boatie Blest’s Chairman and Captain (Archie Johnston and Stuart Mack) and by renowned model boat-builder, Bob McNeil. Martin of Whin Park, was thrilled to win having seen Endeavor on display alongside models of traditional fishing boats at the Boatie Blest Exhibition: ‘I’ve seen these boats at the exhibition during the 3 Harbours Arts Festival and in the windows of local houses. The detail and workmanship which goes into them is incredible so my wife and I were thrilled to hear we’d won Bob’s model which now has pride of place in our window’.